Old school games on the Sega Megadrive and SNES tend to be broken down into two categories – they’re either relatively easy to complete, or the game’s designers are dead set against you seeing the end credits roll. Apart from purchasing walkthroughs in the form of books (there was no such thing known as Gamefaqs.com back then, younglings), you could either get into contact with the local video game maestro and ask his or her help through a particular dungeon. That is, until the Game Genie attachment came along, opening up an entire world of gaming possibilities that turned you into a gaming god (aka cheating). 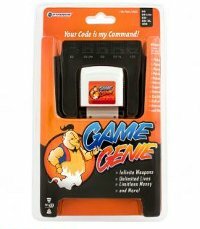 Well, it has been more than a decade now, and a somewhat similar device makes a return in the form of the Hyperkin Game Genie, where $19.99 is all you need to fork out to unlock secret codes hidden in your favorite Nintendo DS video games. It will be compatible with 3DS, DSi, DSi XL, DS Lite and DS handheld consoles, offering you the opportunity to check out the hidden secrets of games as well as unlocking the potential to more than 300 DS titles. Heck, it can also be upgraded thanks to the DS WiFi Receiver.